UPDATED: Federally indicted Patrick (Pat) Fabian CCO of NxThera no longer listed on the company website. 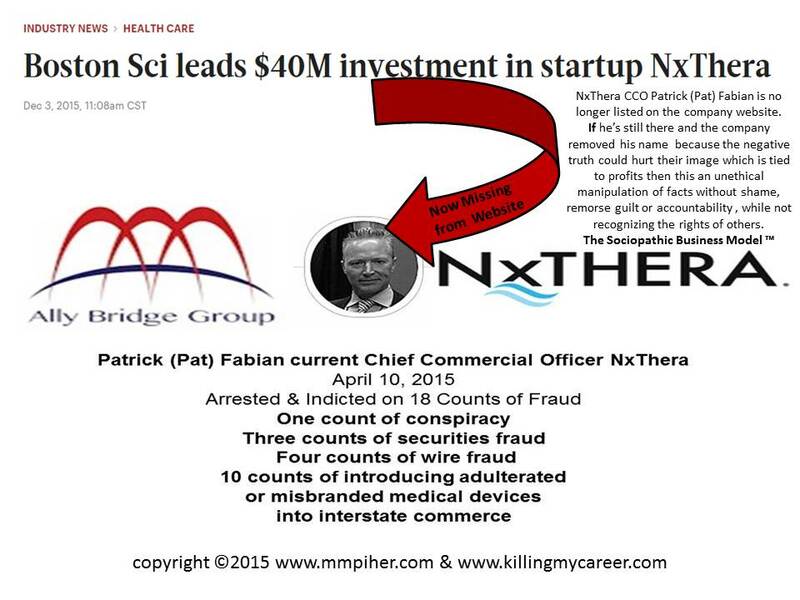 Is this a manipulation of the facts to mitigate the damage from the negative truth potentially hurting the image and profits around Thursday’s announcement that Boston Scientific led NxThera’s $40 million funding round or is Fabian gone from the Company? Updated July 2016: The former Chief Executive Officer William (Bill) Facteau (currently CEO of EarLens) and Vice President of Sales of Acclarent, Inc. Patrick (Pat) Fabian (now of NxThera) a medical device company, were convicted by a federal jury in connection with distributing adulterated and misbranded medical devices. In August, this site asked: What Have the Department of Justice And Johnson & Johnson Been Doing Behind Closed Doors For the Last Four Months? This question was posed regarding April’s announcement of the U.S. Department of Justice’s arrest and indictment of Johnson & Johnson Ethicon Acclarent former executives William (Bill) Facteau and Patrick (Pat) Fabian. BOSTON – The former Chief Executive Officer and Vice President of Sales of Acclarent, Inc., a medical device company, were charged in an indictment unsealed today with conspiracy, securities fraud, wire fraud and violations of the Food, Drug and Cosmetic Act. Sadly, there isn’t much to new to add to this story an entire eight months later except William (Bill) Facteau, currently CEO of EarLens has a trial date set for May 23, 2016. And sadder still is the little-noticed headline from yesterday’s WDRB.com, that failed to make mainstream media, stating startup NxThera, where Patrick (Pat) Fabian is currently CCO, completed a $40 million venture round of funding led by Boston Scientific. Maybe Beth Weinman in the FDA’s Office of General Counsel is finally paying attention. 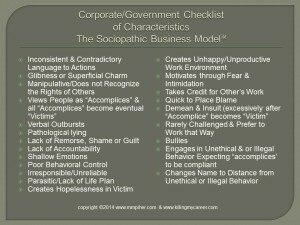 The Sociopathic Business Model™ maintains that venture capital-backed startups encourage, replicate and reward unethical and or illegal behavior, a point that’s clearly consistent when Facteau & Fabian, two federally indicted startup executives accused of 18 counts of fraud including conspiracy, securities fraud, and violations of the Food, Drug, and Cosmetics Act, can easily find work in new startups holding executives positions. The DOJ wouldn’t charge executives with 18 counts of for fraud without having a strong case; however, that’s not always the same as being able to prove their case in court and often times they take what they can get. In the off chance, Facteau and Fabian plead down, flip on Acclarent co-founders Josh Makower and John Chang and avoid jail that’s still not the same as innocent as far as potential employers or taxpayers should be concerned. Innocent until proven guilty is a misleading statement when taxpayers have allowed two known corrupt entities to negotiate on behalf of the American people behind closed doors. If we want to start fixing a broken system then we need to remove executives like Facteau & Fabian from ever again working for any venture-backed startups, where they’re made to permanently step down from any and all board positions or executive positions in the industry; and, the DOJ needs to stand behind the Yates Memo and start putting executives in jail, even if part of a plea deal. 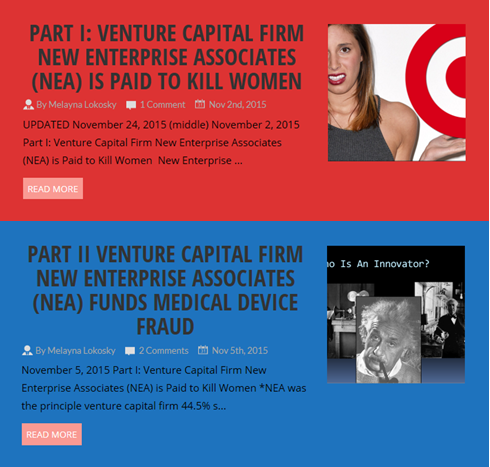 Are VC investors who control the startup NxThera acting unethically? The massive Pfizer-Allergan merger is getting a lot of attention. It is one of the largest takeovers ever in the healthcare industry, worth an estimated $160 billion. But consider another number: The amount Pfizer, Allergan and their predecessor companies have paid to settle government healthcare fraud allegations in the US – a total of nearly $4.5 billion. That total doesn’t include close to $1 billion paid to settle related consumer actions. Pfizer’s and Allergan’s recent histories are so marked by allegations of wrongful – even criminal – practices that regulators should seriously question whether the merger of these two pharmaceutical heavyweights is in the public’s interest. As this site often states in frustation, just how many corporate integrity agreements does a company get to sign before the DOJ realizes that company has no integrity? This site has already chronicled Pfizer fraud where then US Attorney General Eric Holder negotitated the company’s federal fine and less than a year after leaving his position went back to work for Covington LLP who defends Pfizer in white collar crime cases and mergers the same Covington LLP whose also previously boasted about defending Johnson & Johnson, perhaps even the same Johnson & Johnson who purchased Acclarent where two executives await federal trials. Which brings is to Allergan, where earlier this year there were concerns over anti-trust laws, fraud, and let’s not forget about all the problems with the recalled Lap-Band, because I’m sure all Allergan’s patients turned victims haven’t. 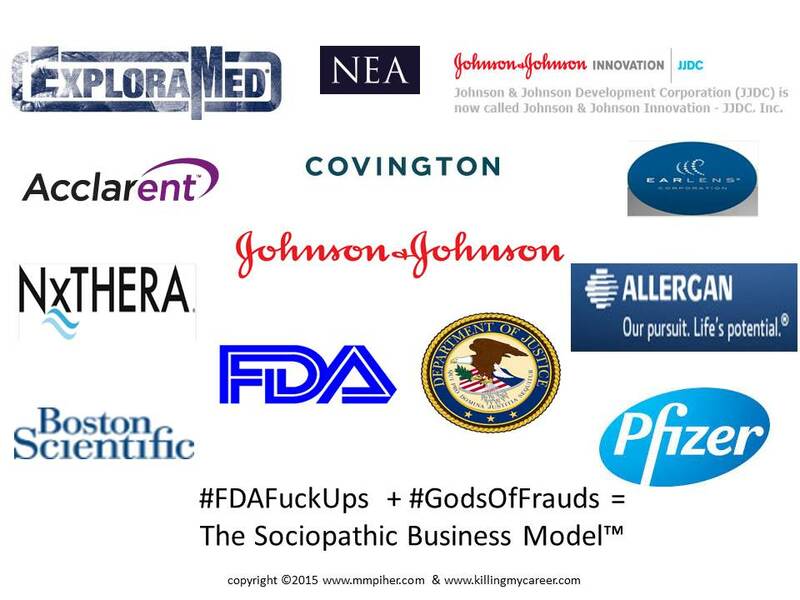 And, these are just the things we know about as taxpayers, remember there’s a lot going on behind closed doors, negative truths that could hurt the image of both the FDA and companies like Johnson & Johnson, Allergan, Pfizer, which they don’t want to the public to know about, why else would they meet behind closed doors? I’d like to personally thank Erika Kelton of Forbes for not being blinded by the billions and looking at the facts of fraud, it’s rare in media today and greatly appreciated not only by myself but the readers of this site, many of whom have been injured patients, consumers, employees and taxpayers at the hands of the corrupt companies who have colluded with parts of a corrupt government. Wow, Melayna. 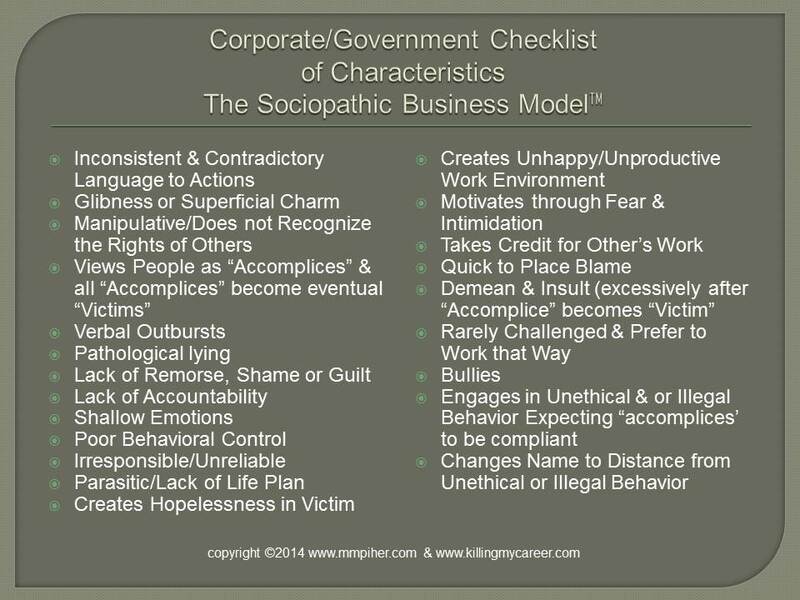 Corruption so ingrained in our society it is regarded as normal. Who would ever see all of this as a typical consumer? Not me, that’s for sure. Thanks for the spotlight on such total disregard for patient safety. Hi Melayna. An update for you. De Puy finally paid appx 50% of my hip revision costs up front. The hospital was in Turkey. Interestingly the agreement stated they would pay the balance upon my discharge. Discharge day came and the hospital financial department kept me waiting all day as that payment did not arrive. Only upon signing a document confirming that I would pay Eu18,000 should DPS fail to honour the agreement was I allowed access to a hospital car to return me to the hotel. The Foreign Patients Liaison lady was totally embarrassed. Of course it was easy for me to sign for two reasons. One, I do not have Eu1800 to my name never mind 18k and two, what patient does not want to get out of hospital as soon as the surgeon signs the discharge? One month to the day since my revision and I still don’t know if DPS/JJ honoured their promise. Recovery is slow, no surprise there. As well as the metal components being loose there was evidence of metallosis and so I feel totally vindicated with fighting JJ almost 5 years to get them to pay up front. My case file has now been transferred from Crawfords Romania to BroadSpire Germany and so I guess my fight to get them to pay a hospital up front to have my left hip revised will be almost like starting afresh. An interesting point made by my British lawyer is that there is some type of statute of limitations time frame of eight years regarding any claim. Something to do with date of manufacture of the defective implant and, a big and; date of delivery to hospital. NOT date of original surgery. I guess this will prevent many people from being able to mount a claim. In theory if a hospital had say several 56mm implants in their stock but the patients were needing 58mm those 56mm could have been sitting on their sterile shelf slowly reaching an expiry date. If, and only if J&J knew from serial numbers those were from the defective batches and they failed to recall, taking a chance that one day they would be used and even if they failed within five years three years on the shelf would take them past the eight year period for settlement of claims. Due to pain meds I do not think I am typing this as clearly as I usually would but I think the bare bones (pun intended) are there despite being somewhat garbled. PCORI. The Patient Centered Outcomes Research Institute is a part of the DOJ. I have occasionally looked at the membership of the PCORI governing board for year now, one board member in particular was especially of interest, Dr. Harlan Wiseman. Today after seeing this post, Melayna, I looked him up again and to my surprise I see that there is now a “Confict of Interest Disclosure” added to his bio. It says “as of Dec. 1 2014”. I’m certain it was added after that date because today is the first I have seen it and I have looked at his bio at least twice during the past year and not seen it. Anyway it could explain the DOJ’s snails pace at dealing with J&J.